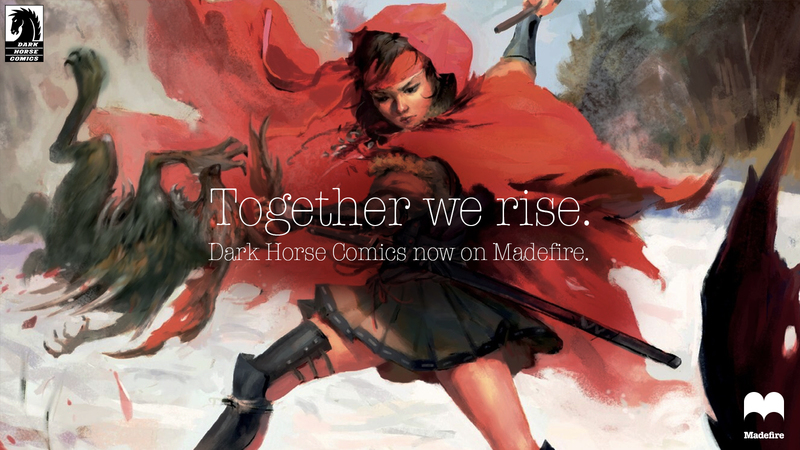 Another publisher added to Madefire – Dark Horse Comics graphic novels! Emeryville, CA, December 13th, 2017 Madefire, the award-winning standard in digital comics and innovator of the proprietary Motion Book™ format, announced that it will be bringing a range of best-selling Dark Horse graphic novels to the Madefire platform starting today. Kicking off with a selection of high-profile entertainment franchises, Madefire and Dark Horse also have plans to expand the catalog in 2018. With an incredible year of announcements behind it, Madefire now carries an unrivalled selection of new and established classics, Motion Books, video shorts, graphic novels, collected editions, and archived favorites, from industry leaders such as Marvel, DC Comics, Image Comics and many others. Now, the unique Madefire platform is the ideal place to discover and enjoy the great talent and range of legendary Dark Horse graphic fiction. The addition of popular graphic novels from Dark Horse Comics is the latest in a spate of content additions for Madefire, including recently launched Marvel Comics®, DC Comics®, Image Comics® and brings together a vast library of digital works that include over 30,000 comics, graphic novels and Motion Books, produced by the best creators and publishers in the industry, including IDW®, TNT®, 20th Century FOX®, Archie®, BOOM!®, Blizzard®, Valiant®, Dynamite®, Titan®, and more. Founded in 2011 by Ben Wolstenholme, Liam Sharp and Eugene Walden, Madefire is a media and technology company, and creator of the award-winning Madefire app. Madefire provides creators and publishers the cutting-edge Motion Book publishing platform which enables a digital-first approach to publishing cross-platform in multiple formats. Madefire is backed by Toni Schneider (former CEO WordPress) at True Ventures, as well as Bill Woodward (Former Chairman and co-founder Macromedia) with angel investors including Sina Tamaddon, former Senior Vice President of Applications for Apple Inc. The Board of Advisors also includes Mike McCue, CEO and co-founder of Flipboard; Dave Gibbons, co-creator of Watchmen, the bestselling graphic novel of all time; and Bill Sienkiewicz, widely recognized as one of the greatest innovators of sequential art. DC Comics, Blizzard Entertainment, Marvel Comics, Image Comics, FOX, Apple, BOOM!, DeviantART, Microsoft, TNT, IDW, Archie, Valiant, Kodansha, Oculus, Framestore and Technicolor. Madefire, the Madefire “open-book” logo, and Motion Books are all registered trademarks of Madefire, Inc.